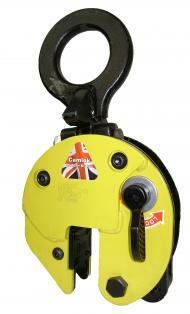 The CY plate clamps with hinged hook rings can be used for the safe handling of plate at various angles. It can lift plate from the horizontal and put down in the vertical. The hinged hook ring ensures adequate gripping pressure in every position, but the load capacity is reduced as seen in the diagram. The main benefit of the CY hinged plate clamps is that longer plates can be lifted or handled, using two clamps on a two-legged chain sling thus eliminating the need for a spreader beam.